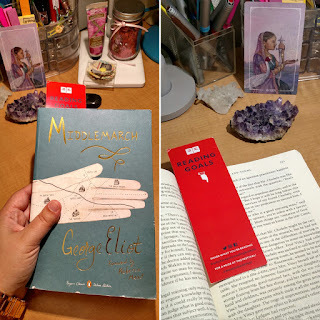 I'm muddling my way through Middlemarch, a read I've long had on my TBR and am finally getting to because my book club selected it for our September read. I anticipated loving it for ... reasons ... and at times I'm enjoying it, while other times I feel like it's going over my head. It's been a long time since a book has hit me this way, so I'm trying to roll with that -- and for good and for bad, there isn't another book clamoring to be read. Middlemarch it is. Have you read Middlemarch? Love it? Hate it? Reading anything great right now? Haven't read it, but I really want to one of these days! Btw, that's a lovely cover you have there. I love the gold foiling used for the text on the cover! I mostly bought this copy because of the cover (and the French flaps and deckle edges) but also because of Rebecca Mead's introduction -- oh, and a fab blog post that suggested this edition as it doesn't contain footnotes -- she found it a more immersive read that way. I haven't read Middlemarch either, but it has been on my to-read list for a while. I really hope you enjoy it.